Shortly after this, Russell taps the iPhone screen with his hook. We all know that wouldn't work. Any YouTube user who receives a copyright notification will be forced to sit through a cutesy cartoon showing them the error of their ways, as part of a new campaign launched by the video sharing site this week. The mandatory video, titled YouTube Copyright School, is a hard hitting animation which demonstrates just how much trouble an animated otter can get into for submitting copyrighted video. 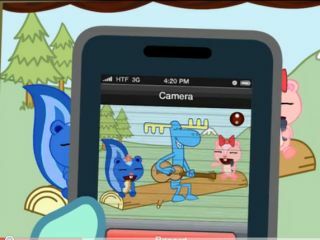 In it, a hapless sea otter pirate named Russell is desperate to share a video of Lumpy, the singing moose. Several yarrrrr-extracting video faux pas later, and Russell finally knows what he can upload (his own content) and what he can't (anything else). YouTube is keen to avoid any copyright lawsuits and has a stringent process for removing unauthorised content, as well as controls for copyright owners to easily allege an offence. To make sure that naughty copyright infringers actually do sit through the video, there'll also be a short test at the end.